Sauté the garlic in the coconut oil, briefly. Add the mince and brown. Add the grated carrot and all the spices at once and stir through until the spices are fragrant, then add the tomatoes and paste and the coriander stems. Add the salt and cook gently so that the flavours develop. While the mixture is cooking, grate some cheddar cheese and cut up an avocado for serving. If you want fresh tomato chop one of those as well. After the mixture has cooked down, about 20 minutes or so, add the cider vinegar and 1/2 C of the coriander leaves and stir through. Turn off the heat. 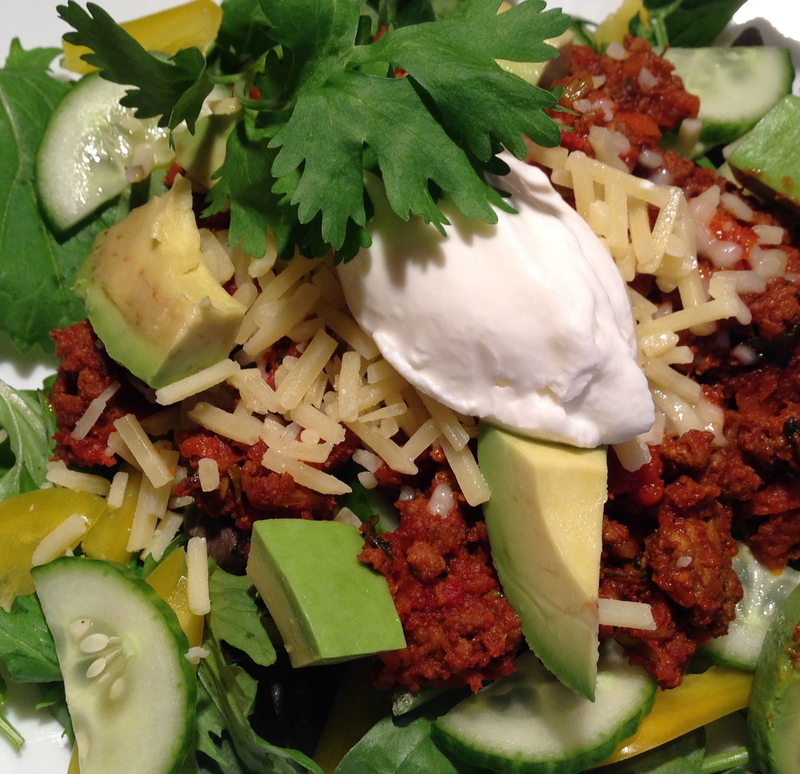 Place the greens and veggies on a plate, top with meat mixture, cheese, yogurt, avocado and tomatoes, as you wish. This will not taste like taco filling made using the packet mix, so don’t expect that. It has a depth of flavour, though, that is delicious.